I have been fortunate to have a string of really exciting projects! I will share what I can, along with the awesome convention news for Origins and Gen Con! This is my first time visiting the storied Origins convention. Though many of my friends attend, it has always been the convention I just had to give up in order to keep life in balance. This year I made an exception, as two of my projects are at the convention! The first project is for the Adventurers League, writing the adventure The Artifact. This is part of the Ravenloft season, which concludes at Origins. I have enjoyed this season’s more story-focused approach, where each adventure should be played in order. I think that focus could have even been stronger for the series, but it probably requires less on the side of authors and more on the side of the AL developers and editors to spend the time shaping what is provided so it fits the whole. That’s because individual authors inevitably get creative (which is awesome) and write something that won’t perfectly join to the other adventures. That creativity can be worth furthering by developers to tweak the adjoining adventures, but it takes a lot of effort – certainly a lesson I learned as a member of the Ashes of Athas admin team. 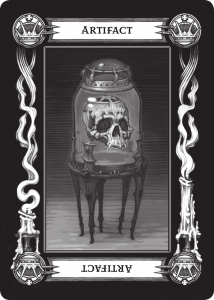 Update: You can now purchase The Artifact on the DMs Guild! There is also an accompanying Map Pack! So, what can you expect in The Artifact? The summary text is: An expedition to the Amber Temple reveals another major minion of the enemy and uncovers a secret weapon that may help defeat them. Part ten of Misty Fortunes and Absent Hearts. I’m a huge fan of the Amber Temple – an incredible new location detailed in Curse of Strahd. I had the opportunity to add to the temple and to the cool secrets it reveals about Ravenloft’s dark powers! If you have the hardcover adventure and see the rubble… I add a secret level hidden behind it. The adventure is a mystical gothic murder mystery and really is my first attempt at creating a whodunit experience in a D&D adventure. It also works well for DMs running Strahd, as it can expand the experience or offer an early foray into the temple. I am really pleased with the experience the adventure provides. If you played it, share your experience through the contact form! There are a few Easter eggs in the adventure… if you know your organized play history you will likely realize that I’m tipping my hat to some heroes of the RPGA/organized play. Origins is a quirky convention. The web site is not very obvious, and includes lots of empty or illogical pages, such as the empty About page. Badge registration was not hard, though as I am volunteering for Baldman Games and Origins doesn’t give out badge codes in time, I had to buy a badge and then get reimbursement… which I am still waiting for! Event registration was confusing – I didn’t even realize how to get to it until someone told me I had to look at my badge. Though non-obvious, entering 15 minutes late or so still earned me every single event I wanted to play! That’s a big advantage over high-demand Gen Con. And, when I needed to make a change it was simple to do so (even though several weeks later many events were now sold out, I still found some options). I am earning my hotel room through judging for Baldman Games, but this is another case where it is far easier than Gen Con (or PAX). I am super excited about two other Origins developments. I am so excited about WotC announcing the return of the Open! Here is how they describe the event: Brave the depths of Undermountain with five stalwart companions in a race against time as you face vile monsters, diabolic puzzles, and inscrutable NPCs. This event will space nearly 8 hours of continuous play, with an hour break for dinner, on Saturday. Bring your existing Adventurers League character of up to 10th level or create a new one at 1st level. Undermountain is open to all challengers. D&D tournaments go back to the early days of conventions. The 1975 running of the early form of Tomb of Horrors at Origins I is considered the formal start. Tournaments were competitive events, where each table of players was scored and the best tables would come back to play later rounds. Many tournament scenarios went on to become classic adventures, including the giants and drow adventures, the Slave Lords series, Tamoachan and Inverness, Tsojcanth, and more. DM David shares fond memories of the Championship and why the elements of adventures such as Tomb of Horrors can be so much fun. Tournaments at Gen Con fell under the moniker of the D&D Championship or D&D Open, starting in 1977. The Open ran almost every year, but was canceled by Wizards after 2008. Even in those final years, several heroes (including Chris Tulach at WotC and Dave Christ at Baldman Games) did what they could to keep it alive. It looks like Mike Mearls, new organized play lead Chris Lindsay, and probably also previous lead Chris Tulach are the heroes bringing it back. This time it runs at Origins, and the format is made so it will appeal to a much wider audience. It is AL compatible (and probably provides some awesome loot). And, the competitive nature is said to be one where groups can win in different ways. Even a group of new players gets to play through the entire event and can accomplish epic deeds. I can’t wait to see how it runs! Update: Now that the information is public (it was announced at Origins), I can share that this was my second project, which I wrote along with the awesome Shawn Merwin and Shawn Molley. I will write more on writing the Open soon. New Story-Focused Moonsea Series by Baldman Games! Baldman Games is now creating adventures based in the Moonsea, expanding upon the cities where we adventured during the first three seasons of AL play. Trilogies of adventures launch at conventions, starting with Origins and Gen Con. I am playing the series at Gen Con with my old gaming group and I had a small part in some of the conceptual work behind the campaign. Some of the elements that made Ashes of Athas a successful campaign are used in this one. And, of course, the campaign will bring its own innovations, all while being fully compatible with all types of AL play. Update: These were amazingly well received at Origins. I didn’t play or run them, but tons of people talked to me about how great these were! 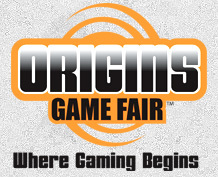 What else is at Origins? The introductory adventure for the new AL season! The new season is Storm King’s Thunder, disclosed on June 1 with a huge event (read about it here) featuring several cool gamers such as Mathew Mercer (who once ran Confrontation at Candlekeep at a convention! ), Alison Haislip, and Ashley Johnson. We are truly seeing the evolution of D&D as a brand, as well as the growth of online live play. I’m all for it! Update: I ran this and it was fantastic at pleasing players, from kids to adults, from new to casual. Storm King’s Thunder features giants, and I’m a huge fan of how D&D has developed giants over the years. I absolutely loved the giant-themed story in my region of the Living Greyhawk campaign, where we slowly won back the Duchy of Geoff from giant control. It was amazing. Sign me up for more awesome giant stories! 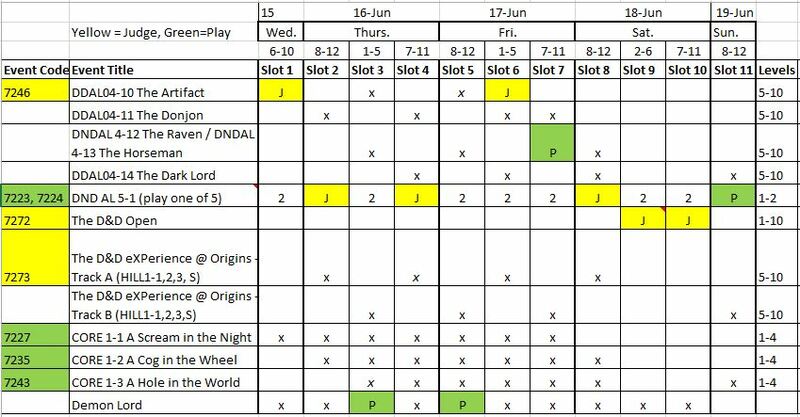 Here is my Origins schedule, including the events I am judging. Let me know if you might be at my table! When it comes to Organized Play, one thing is constant: change. WotC seems to have (for now) broken up with Gen Con. Origins is clearly the show where they will launch their big and shiny efforts. This is probably due to the cost and complexity. While WotC once owned Gen Con, it is now a very expensive convention for almost any company to attend. Many RPG companies will likely look to what WotC is doing and consider whether they too should shift focus – dollars go a lot further at other conventions. 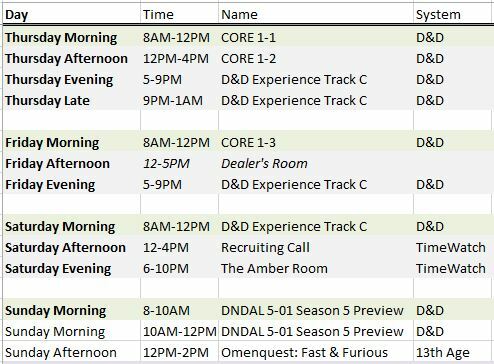 At the same time, Gen Con is likely to make adjustments as well. Gen Con remains my old gaming group’s favorite convention, even if hotel and event registration are insanely frustrating. When the hotel lottery doesn’t pan out, the cost is really huge. Events continue to be really affordable – I would argue the costs should go up for almost every event type and that the higher fees should then help create a better experience and increase what RPG companies get to keep. This is the first Gen Con since 2009 where there isn’t a D&D event with my name on it. Wow, how fortunate have I been? When I wrote the Living Forgotten Realms adventure What Storms May Come I could not believe it when I heard it would come out at Gen Con. DMing those tables… I was walking on air. I would never have guessed I would have had such an amazing string of events. A second LFR adventure, Ashes of Athas, Candlekeep, the first AL Epic, AL adventures… I really am so thankful for the people who trusted me, and continue to trust me, with these amazing responsibilities. Thank you. At Gen Con I will be playing through the new Baldman Moonsea adventures, including the D&D Experience. Our group will also play several other RPGs we enjoy. Here is my schedule. I’m very sad that this year I couldn’t land a game of Nights Black Agents, which is always so much fun. Spycraft is running some previews of the new edition (again), but the times didn’t fit into my schedule. And I always hope for a game of Deadlands, Paranoia, or other fun games… and never land a ticket. Update: Since it has been announced, I can now share my third project. For the first time, the PAX live-play Acquisitions Incorporated event will be broadcast live to 300 theaters around the US. If you attend the events, you will receive an adventure I wrote! The adventure follows heroes who have an opportunity to become interns for the renowned adventuring company, Acquisitions Inc! It is legal for Adventurers League play. You can learn more about the Fathom event here. 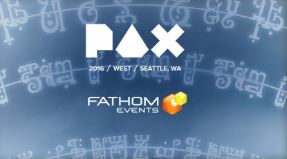 Information on Wizards of the Coast play at PAX can be found here. There are some things I’ve been wanting to discuss, but just haven’t had the time due to the various D&D projects. Good problem to have! Drawing more female authors to writing organized play: This topic came up recently. We have had amazing female authors in the past, but authors have historically been predominantly male and very much so of late. The RPGA has thrice been led by women, but we clearly would benefit from increased diversity. I hope to focus on this once my current project finishes. Adamantine Chef was mentioned on the latest D&D podcast (now renamed Dragon Talk and requires resubscribing due to the name change). I really appreciate Nathan Stewart bringing it up, even though I do wish the podcast was for all ages and de-emphasized drinking. While it can be fun to drink and game, I find that the kind of thinking I do when running and playing D&D is often the opposite of how I feel when I drink, so I don’t find it good for the hobby to try to sell D&D by associating it with overindulgence. The Angry DM again writes a really thought-provoking article looking back at 4E D&D’s design. I am a huge fan of 4E and appreciate with his insights, even while disagreeing on a few points. Great read! I recently helped Cub Scouts get their Game Design badge. I hope to write more about the experience, but I highly recommend this if you have the chance. Author and artists have been sharing some of the cruel comments they receive from “fans”. Please, please, be respectful of the people who do so much for our hobby. Think about the impact your words have and consider using them to bolster rather than to tear down. There is a place for criticism, but it should be respectful, constructive, and grounded in how our individual perspective seldom speaks for a majority. This entry was posted on May 29, 2016 by Alphastream and tagged 5E, Conventions, Gen Con, Origins, PAX, Ravenloft, RPG History.